It's been awhile since I typed in my blog and forgot how to insert a photo....so I hit the wrong key. What is a "Teacher" Watch and What Can You Do With It? Okay, it's simple. Do you remember or have you seen the petite little tailored wristwatches from the 30's-60's? They usually come in a goldfilled case but sometimes you'll see them in silvertone. If you are of an age, like I am, your teacher in grade school probably wore one, or you might have been given one as a young teenager. You can do cool stuff with 4-5 teacher watches, some large jumps and an assortment of charms, and it won't take long. This is one of my faves, it's in my own collection. 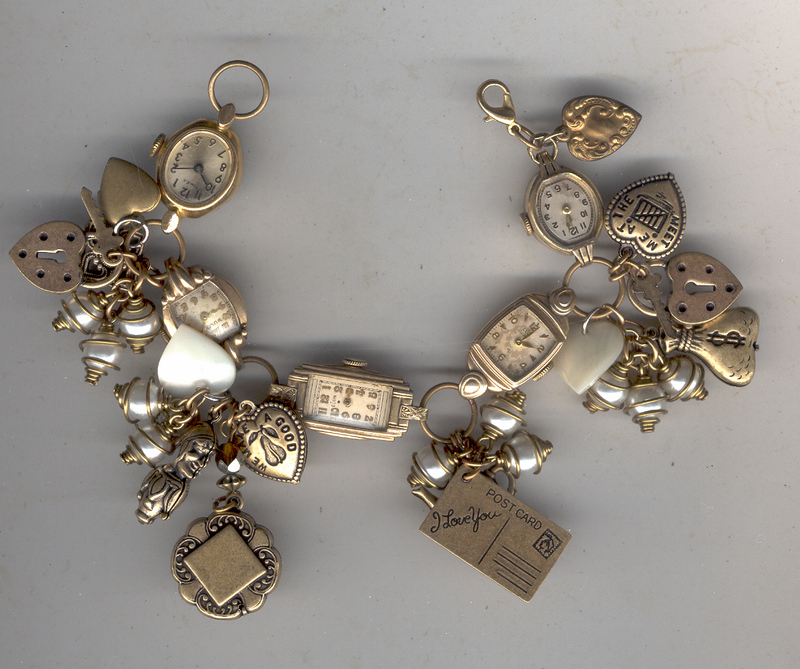 I've pieced this one together with several watches (one even works, but I really don't care, I like the graphics of them) along with some charms and caged pearls. I finished it with a lobster claw clasp. What a hoot! We've introduced Russian Goldplating to our Stampings Section on the site. This is a very special finish and I worked with a plater to achieve just the right hue for vintage-style jewelry. As stocks of our antique goldplated stampings dwindle, they will be discontinued in favor of the rich glow of the Russian goldplate, which is mellower and more like the look of old Victorian rolled gold. The greatest appeal of Russian goldplate, for me, is the way it matches up to the look of the great mid-20th century jewelry designers, such as Miriam Haskell. The true OLD Russian goldplate is a form of brassplating back over brass. It is not available anymore. Our Russian goldplate is actually a matte true goldplate, with a little real gold in the plating, with a cinnamon antique. The look of it is sooo close to the old true Russian goldplate that you have to look twice. It is truly beautiful! Try some!